Restaurants have always used techniques like coupons, freebies, and cross-promotion with other businesses in their marketing efforts. These tactics are tried, tested, and have worked for many years. Now, it seems like people spend more time looking at their phones than communicating with their lunch dates and noticing what’s going on around them. Furthermore, restaurants are the most searched industry by consumers on mobile devices. So, why not put your message where they are sure to see it? These mobile marketing tools are sure to help your restaurant thrive by getting you seen where customers are already looking - on their phones. The conversion rate for local searches on mobile devices is an astounding 80%. More than half of the customers who find you online are going somewhere. Don't you want it to be your restaurant? When potential customers discover your restaurant from a mobile search, it is your job to make sure that they are greeted with a pleasant experience. This means that your site needs to be responsive. Flavor Plate makes it easy to ensure the responsiveness of your site, and it was created specifically for restaurant brands. Flavor Plate’s platform was designed with ease-of-use for the restaurateur in mind. With this tool, you can create, manage, and leverage mobile-optimized websites for your restaurant without hassle. The platform offers a 14-day free trial and costs $9 to $35 per month thereafter. Features of the system include a website manager, gift card shopping cart, menu manager, and social sync – you can manage all menus in one place and share to your website and Facebook at the same time. What’s also great about Flavor Plate: it integrates easily with Mailchimp, the industry standard email marketing platform. You can also use email template customized for your website, leverage built-in mobile photo gallery, events calendar, SEO optimization, online reservations and Google maps. With this Swiss Army knife-like solution you will have complete control over your website and seamlessly optimize it for mobile view and interactions. Not sure if your current website is responsive? Run a Mobile Friendly Test with Google Webmaster Tools. 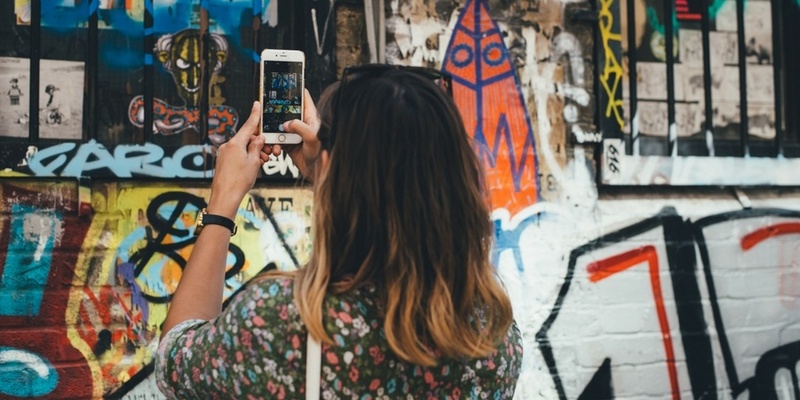 Mobile marketing is now more important than ever. The iPhone has been around for nearly a decade. Since this device redefined consumer behavior, mobile advertising has become more and more of a necessity for all industries. Restaurants are no exception. Thinknear can be the solution you need. Thinknear is an advertising platform designed specifically for mobile. The platform creates ads and pairs them with consumer behavior, data crunching, and location services to promote your restaurant in the right places at the right times. Many top ranking companies work with this system to deliver targeted ads to their potential customers. Check Thinknear resources for the dining industry: a Mobile Marketer’s Quick Guide to Foot Traffic, Quick Guide to Restaurant Marketing, case studies, analytics tools, and educational articles. Find out how they can help you with targeting and a custom creative suite. Text message campaign is one of the core elements for any restaurant’s mobile marketing. With SMS marketing, you can serve your customers more than just food by delivering specials, coupons, and other time-sensitive offers to those who have opted in to your promotional list. You can also provide amazing customer service with booking, order, and payment confirmations. TextMagic provides a wonderful way to do it all. 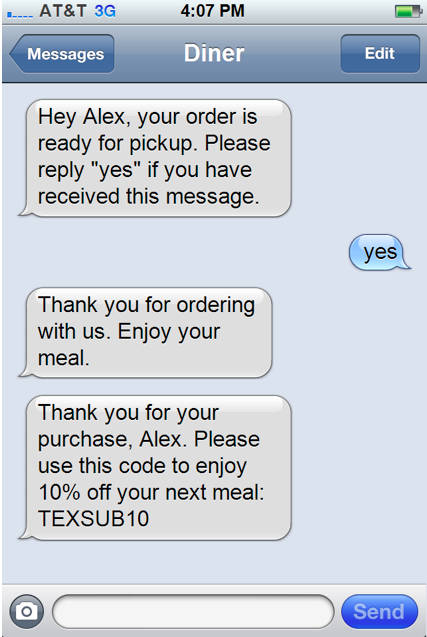 TextMagic’s bulk SMS service provides a simple, thorough, and cost-effective approach for smart restaurant brands who want to enhance the dining experience of their patrons. The platform offers online text delivery, two-way SMS chat, and the ability to schedule texts in advance. You can simultaneously personalize and scale your text messaging campaign by using templates and emailing to SMS distribution lists. Run a contest, send out the link to coupon that expires in a few days or text booking reminder – these ways are super effective when it comes to growing customer loyalty. 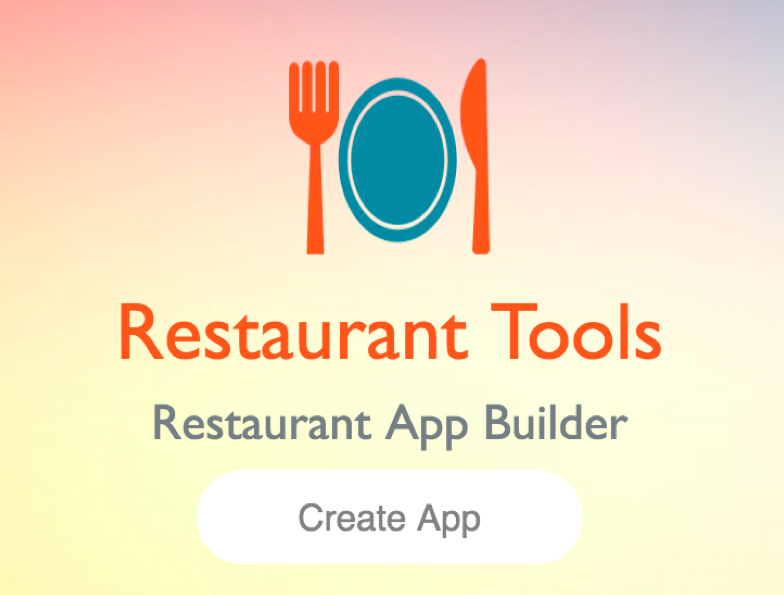 Mobile apps are increasingly popular for restaurants, and with good reason. With a mobile app, you can be in front of your patrons at all times - not just when they’re looking for you. You can deliver all of your promotions, menu items, hours, and any other pertinent dining information in one space that is easy to access. This enhances the relationship between you and your customers, and can facilitate an immense return on investment. Appy Pie has you covered. With an Appy Pie app, you can enjoy a range of features with a customized, branded, invaluable marketing tool for your restaurant. Make use of menu creation, an online ordering page and in-app ordering with Paypal. It’s easy to build customer loyalty programs there: add a digital loyalty card, information about coupons and discounts, happy hour alerts, and integrate with online ordering websites. This tools also allows you to leverage the local nature of your business: add GPS maps, promote your events and create event listings integrated with Google Calendar, add push notifications, use a photo gallery integrated with Flickr or Picasa, and access to your app holders’ purchase behavior with Google Analytics. There is a free tier, and costs up to $50 per month for Platinum features. This app building system is worth trying. This is the huge mobile marketing asset that restaurants may not have considered yet, but need to. Their mobile tools suite offers an “engagement platform” to help you better interact with your customers. Each feature brings its own unique value, and each point is worth exploring. ScanLife has a full-featured platform to explore. ScanLife’s mobile engagement platform offers the opportunity for you to intelligently engage with your customers. Enjoy cloud-based code management, over 15 million mobile engagement actions, mobile website builder, surveys, mobile web pages, designer QR codes, flexible account management, sophisticated analytics and reporting, and more. ScanLife costs $49 per month and includes a 14-day free trial. Try it for yourself and experience the value. Mobile marketing is now, not the future. As a restaurant owner, it’s time to get on board. You will sustain and grow your business by leveraging modern tools for creating a mobile optimized website, taking advantage of mobile advertising, leveraging SMS marketing, using a branded mobile app, and participating in a mobile engagement suite. If you try and test these tools today, you are likely to transform the way you reach your mobile audience and grow your business.